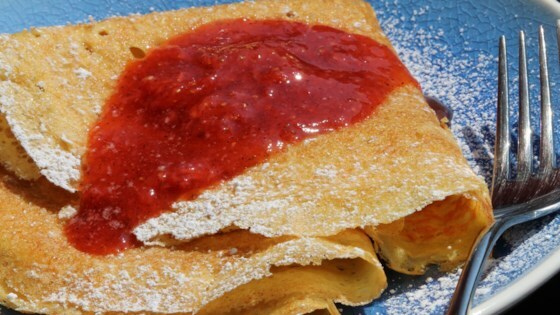 "Delicious crepe-like pancakes that are sure to please. You may double or triple the recipe. Serve with warmed maple syrup or a sprinkle of confectioners' sugar and a squeeze of fresh lemon juice." Pour milk into a microwave-safe bowl. Heat in the microwave until slightly warm, 20 to 30 seconds. Whisk in butter. Whisk in eggs. Add flour, baking powder, vanilla extract, and salt; blend briefly with an immersion blender to make a smooth batter. Heat a lightly oiled griddle over medium-high heat. Drop batter by large spoonfuls onto the griddle and cook until bottom is golden brown, 2 to 3 minutes. Flip and cook until browned on the other side, 2 to 3 minutes. Repeat with remaining batter. Try adding zest of 1/2 or a whole lemon to the batter. Delicious with a side of yum! These are very similar to a crepe. The baking powder makes them spongier than a crepe. These were very good the next day, too. Thank you for the recipe. Thin , light , delicious, low calorie perfect for weight watchers. I cooked mine on medium heat and it worked well! I slipped and put too much salt in... but other than that, they were delicious. Excellent! I put 2/3 cup of flour instead of the half cup. They were just a little too thin before.